Mine is 1.54.5, just to share. Taking a gamble and going for soft soft. i can run please? ?? pasword? ? Start was fast as usual until I got too much on the grass and spun. After that it was catching up. Meyer also had a fall of or more at the beginning and he ended up behind me. My plan was to block him but he touched my rear and there I went. After that is was between Hawk and me; both for position and who could fall of the most. He must be my lost twin brother! Was it you i binned in the 2nd corner? sorry mate! got a little hot in there avoiding two other riders braking little earlier than i expected. Thanks for a great race guys!! 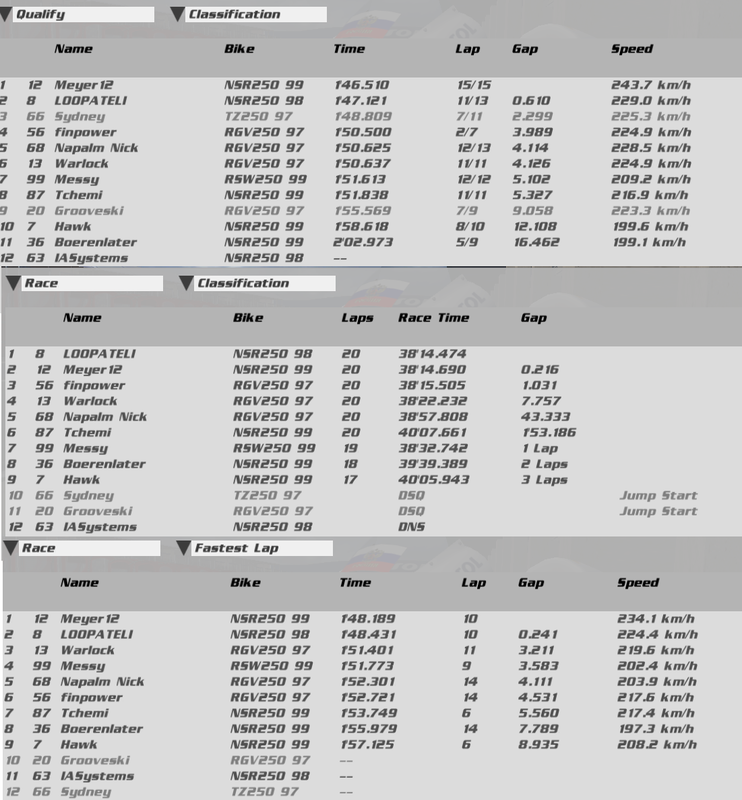 Really crap, I let the aliens go and settled in to a nice steady run for 15 laps in 3rd just monitoring the gap to 4th. Then suddenly I catch the aliens having a bit of a training day fun and got distracted to crash and throw it all away! We need a league where the aliens can be pushed racing against other aliens while the rest of us can have our (puny) race together. Sorry mate, didn't know it did hit you then, i didn't feel my bike moving, just looked like you was a bit too hard on throttle. sorry once again. As always the start missed and the last the pursuit started. Somehow I could not drive my speed.in the last 3 rounds my request (soft) left the spirit. I'm from behind powerful under pressure. But once again without crash drove. Has made a lot of fun again and we will meet again in the next race.